Hipster jokes aside, catching stadium status musicians at exclusive venues is always going to make your friends a little envious. 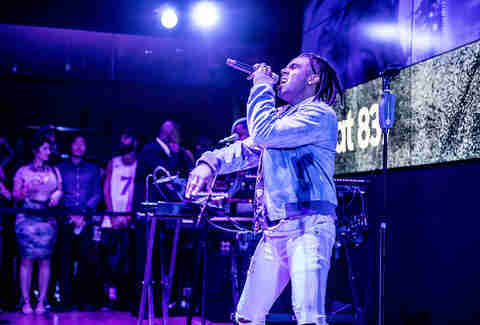 The crowd at Samsung 837 got just that chance when hip-hop artists Vic Mensa and Pell played at the space together this month. Samsung 837 is a tech playground in Manhattan’s Meatpacking District. You can do everything from get your phone fixed to live out a virtual reality experience to catch a concert or movie screening. 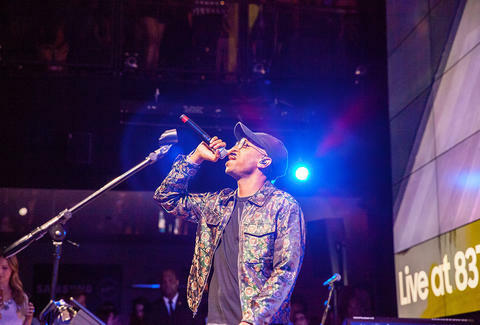 Pell and Vic Mensa were there as part of Live at 837, a series of live music performances that combine the arts and Samsung’s tech. 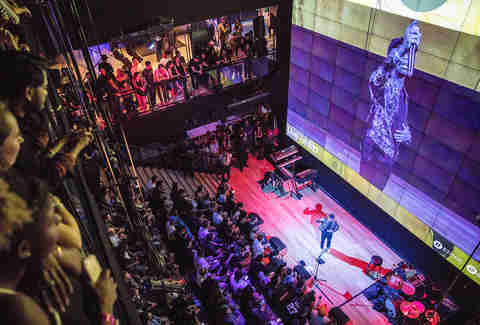 It’s an intimate environment for a concert, and Mensa said it was the perfect space to share his latest album, The Autobiography, with his fans for the first time. “The fans are what bring my performances to life and I can’t wait to experience this with them,” he told us. Pell’s given name is Jared Pellerin, and he’s a native of New Orleans, but was displaced from his hometown after Hurricane Katrina. In previous interviews, he’s said that when he left his home, he took a beat pad with him and subsequently spent the next few weeks messing around with making beats while searching for a new place to live. It was during that experience that he learned to express himself through music, but it wasn’t until he heard Kanye’s Late Registration that he decided he would try to make it big in the music industry. Today, he considers Kanye one of his biggest influences, along with growing up in New Orleans, where big band and bounce reign as the city’s most recognizable sounds. You won’t hear a ton of those sounds on his album, but there are definite nods -- like a track on his LIMBO album titled “Cafe Du Monde,” a call out to the famous NOLA cafe in the French Quarter. Pell describes his sound as “Futuristic Soul” -- a mashup of dreamy hip-hop and electronica beats. “But I feel like it comes from the heart and it’s something that can be felt, that’s why it’s soulful,” he told Vibe earlier this year. “It’s futuristic in the fact that it can make you feel uncomfortable.” When it comes to the lyrics, though, he told us that his life and social experiences are the biggest inspirations. “Second would be what I see in nature,” he said. Because of that, it may come as no surprise that Pell can write everywhere. He told us that he doesn’t have a set routine when it comes to writing his music. Instead, he’ll write whenever and wherever, as soon as inspiration strikes. This nomadic approach to songwriting means new music is always in the works -- including a few new tracks from his upcoming EP this fall, which he played for the crowd at 837. One of his favorite bands? Kings of Leon. The hardest part about traveling for months out of the year, he said, is maintaining relationships along the way. To combat the transient nature of his social life, he always travels with a journal close by -- and wouldn’t leave home for a tour without it. “Everything must be documented,” he said. Since he started making music professionally around five years ago, Pell’s played hundreds of shows. Over that time, Pell’s developed a pre-show routine: “A prayer with my friends and a shot of whiskey,” he told us. The shot isn’t to calm nerves though. It’s not big crowds that scare Pell -- he says he’s actually most anxious when he plays new songs in front of his brother for the first time. Along those lines, more intimate shows, like the one Thursday, definitely make him more nervous than bigger crowds. One of Pell’s favorite songs to perform is “Eleven:11,” which was remixed in 2015 with G-Eazy into “Got It Like That -- Eleven:11 Remix” and now has nearly 12 million streams on Spotify. He closed his performance with it Thursday, after mixing in some of his Floating While Dreaming tracks and new songs.